A Thought Shared ....: ET Phone Home..
From the point where you are standing, nowhere on this planet is further away than 12,000 miles. It seems like a long way, yet the world is very much a global village these days. Television, satellite transmissions, video conferencing and e-mail can bring all four corners of the globe right onto the screen you are looking at now. It is a small world. The photograph on the right shows just how small. This is one of the famous three pictures of 'Earthrise', and is seen here as originally aligned. And if you think that is small, compare our relative size to some of the other babies in our Solar System. Note that size is relative, and not distance. We are the third rock from the left. Our Sun is 93,000,000 miles away from us, and Pluto is at a distance of 3573,000,000 miles. The nearest star to our Solar System is Proxima Centauri, the smallest of a three star group known as Alpha Centauri. 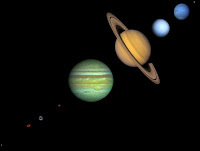 This group is 4.3 light years distance away, where one light year represents 5,865,696,000,000 miles. We see Alpha Centauri as it 'was' 4.3 years ago. 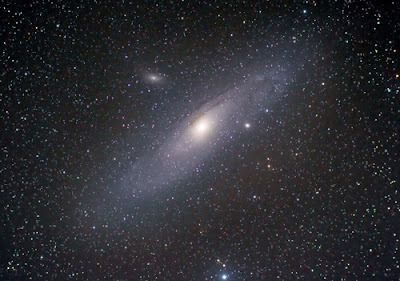 Incidentally, we believe that the Andromeda galaxy is 2.5 million light years away from us! All of the above is truly awe-inspiring, but what I find so strange is that we know more about space than we do about what is in our oceans and forests.